It is colossally difficult to run a profitable restaurant, much less build a brand successful enough to open a second, a third, a 20th location. Which is to say, if you have your sights set on becoming the next Ray Kroc or Dave Thomas, the odds are overwhelmingly not in your favor. 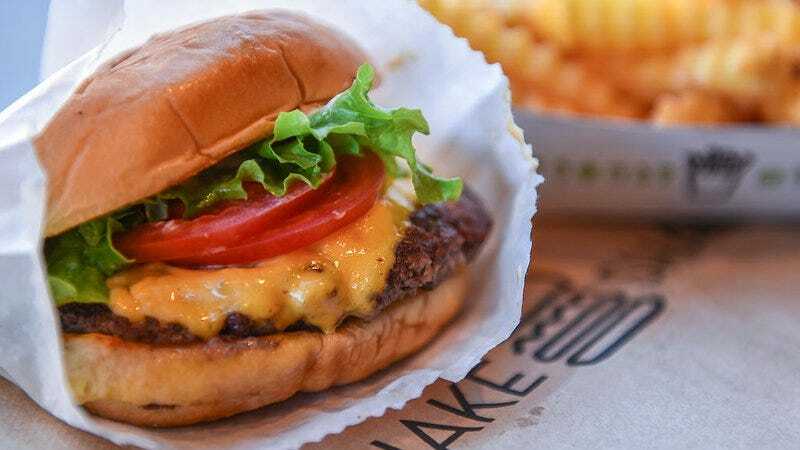 It makes the success of Shake Shack, which began as a kiosk in New York’s Madison Square Park in 2004 and now has 100-plus locations worldwide, that much more staggering to comprehend. At heart, Shake Shack serves burgers, fries, hot dogs, and milkshakes. But its combination of fine-dining-quality ingredient sourcing (its beef patty is a proprietary blend from famed butcher Pat LaFrieda), the financial backing of New York restaurateur Danny Meyer, and the buzz-generating visuals of absurdly long lunch lines helped launch the brand into the stratosphere. In their new book, Shake Shack: Recipes & Stories, Shake Shack CEO Randy Garutti and culinary director Mark Rosati share their shack-to-empire story and offer tips on replicating Shake Shack menu items at home. I actually don’t think you can ever fully replicate a SmokeShack burger or Shack Attack Concrete at home, since so much is incumbent on procuring ingredients from specific purveyors. After you buy the Rick’s Picks relish and Vienna Beef hot dogs and double-grind the necessary brisket, chuck, and short rib to make its beef patties, you’re probably better off spending the $7 to have Shake Shack make it for you. Still, as a way of pulling back the curtain to reveal the restaurant’s method for success, the book is an entertaining read (there’s a particularly promising recipe for fried ale-marinated shallots). Perhaps the most practical recipe from the book is its homemade version for ShackSauce. What follows is the recipe for that all-purpose, dip-with-anything awesome sauce, which is spread atop Shake Shack’s burgers. The key to this sauce’s effectiveness is its versatility, and it’s versatile because it’s, frankly, difficult to describe. At least with McDonald’s Secret Sauce you can say it’s Thousand Island dressing or that Arby’s Horsey Sauce is a horseradish mayo. But with ShackSauce, it tastes like… I guess, sauce? More specifically, a savory pinkish slather that goes well with salty foods? I’ll put it this way: If I have a plain piece of meat or french fry and this sauce is within arm’s reach, there will be dipping. Photo: Christopher Hirsheimer. Reprinted from Shake Shack. Copyright © 2017 by Shake Shack Enterprises, LLC. Published by Clarkson Potter/Publishers, an imprint of Penguin Random House, LLC. Put all ingredients in a small mixing bowl and stir until well combined. Sauce will keep, covered, in the refrigerator for up to one week. Reprinted from Shake Shack: Recipes & Stories by Randy Garutti and Mark Rosati. Purchase the book here, which helps support The Takeout.